Nodes utilize inexpensive hardware such as RTL-SDR and HackRF radios, and computers as small and inenexpensive as Intel NUCs. 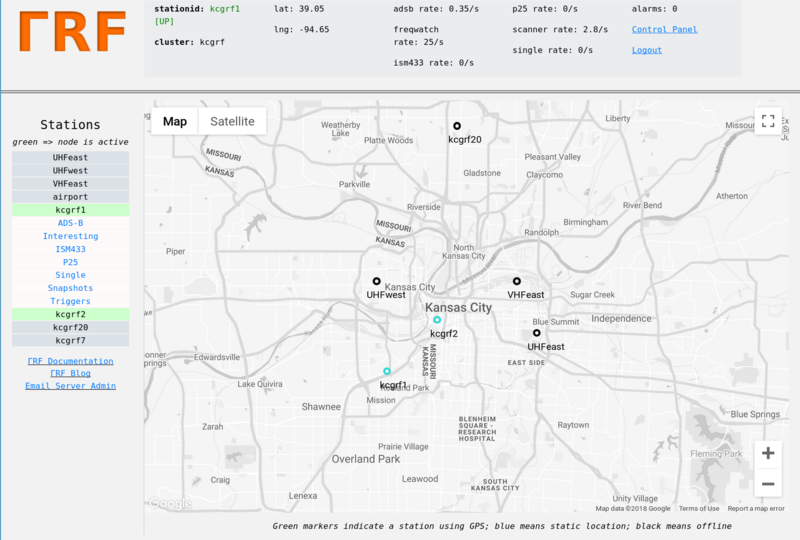 Each node runs modules which provide various radio monitoring functionality, such as monitoring frequencies for “hits”, watching power levels, keeping track of aircraft (through ADS-B), and more. Nodes are distributed geographically and their data is combined on the server for hybrid analysis. Below are some examples of what can currently be done with the system. Development is in early stages and many more capabilities are expected to emerge. There is an open-source client available here. The client interface is text-based, as shown in the below image. We cover installation and usage of this client later in this documentation. The server collects, stores, and correlates data from clients, and provides an elegant web interface for analysis of its data. In the first image below, we see a ‘snapshot’ of a frequency band (frequency vs. power), for station kcgrf1. 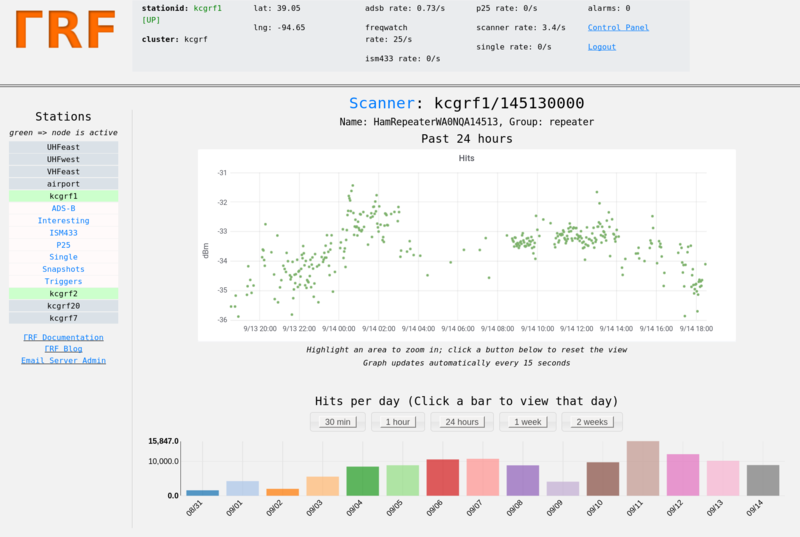 Below that we see the same station’s activity log for one of its frequencies of interest, a ham radio repeater in this case. 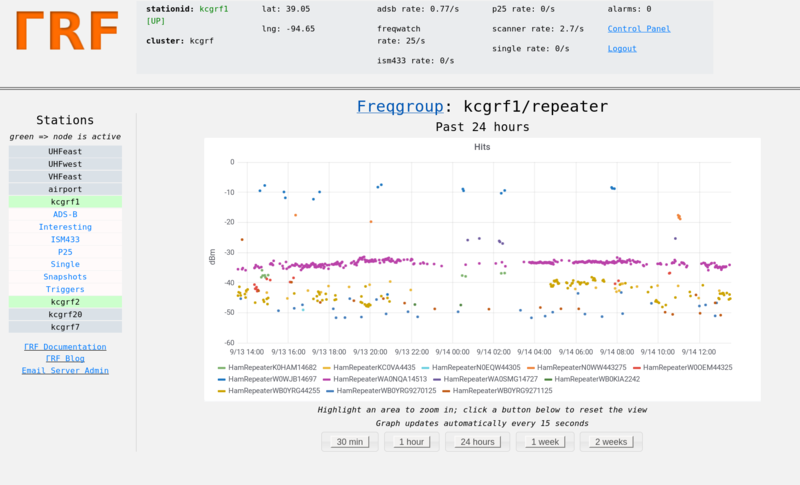 The last image is a combined graph showing the station’s log of hits for all repeater frequencies that it is monitoring. © Copyright 2018, ΓRF. Created using Sphinx 1.7.5.